For each individual Massage Therapy is about finding the best available Registered Massage Therapist (RMT) to assist you in responding to the demands of your life. This could include an initial assessment and appointments for treatments on an “as needed” basis. Golfer’s elbow in the autumn, lower back pain after shovelling snow, treatments to alleviate the early stages of carpal tunnel syndrome.A person with a chronic condition such as diabetes or arthritis could arrange for regular treatments to continually assess, care and avoid or lessen pain and dysfunction. How do I prepare to be a massage therapy patient? Select your RMT with careful questioning. The RMT who helped your cousin may or may not be the best therapist for you and your lifestyle and its demands. Also enquire about wait times for appointments. In New Brunswick many regions have a shortage of RMTs. It’s best to be proactive and make regular appointments to stay on top of any developing symptoms before you develop pain. Inquire about rates, forms of payment, direct billing insurance coverage and submission of claims. The day of your appointment shower, and avoid using perfumes and oils or creams, wear clean clothes, and arrive in the clinic at least 10 minutes prior to the appointment time. The RMT will ask you to share your medical history, current complaints, aches, pains, describe your life style and expectations. You will also sign at least one form giving permission for treatments. The RMT may briefly describe what your treatment will involve such as many minutes of massaging of the shoulders and neck. The RMT will request you to prepare for the treatment by removing some clothing. In the privacy of the treatment room you will remove those clothes as requested lay on the treatment table and cover yourself completely with the clean sheet provided. Sometimes there is a signal to let the RMT know that you’re prepared. Sometimes the patient simply waits till the RMT has completed notes or records and then enters the treatment room. The RMT may or may not play music and may or may not ask your opinion about the music. If music is played it is usually very relaxing instrumental music. During the treatment the RMT will uncover the part of the body that needs treatment, such as one leg. The rest of your body remains covered. When the treatment for that leg is completed the RMT will cover the leg and uncover another part of the body, such your back and continue the treatment. Then the RMT will cover that part of your body and continue until all of the parts of the body that need treatment have received therapy. During the treatment the RMT may ask you to report what you are feeling, describe the feeling or may simply suggest that you relax and allow the therapy to assist you to feel and function better. At the end of the treatment the RMT will leave the treatment room to allow you to dress in private. Following the active treatment you will meet the RMT to discuss any further treatments and to receive instructions for at home care and very likely, a reminder to drink enough water to flush any toxins released from tissues during the treatment. You may want to take note of these instructions because following those instructions will increase the effectiveness of your therapies. You will receive a receipt for your treatment cost. Ensure that the receipt includes the correct date of the treatment and the name of the RMT who provided your treatment. Massage therapists help to manage acute and chronic health conditions, rehabilitation and sports injuries. Massage therapy is also a preventive measure against everything from muscle strains to hypertension. Studies have revealed lower anxiety, stress hormone levels and increased function of their immune system in patients who receive massage therapy. Increasing awareness of the benefits of Massage Therapy has led to a significant increase in research that investigates and substantiates these benefits. The Touch Research Institute, and the Massage Therapy Foundations’ (MTF) International Journal of Therapeutic Massage & Bodywork (IJTMB), are two organizations that provide extensive research on the benefits of massage therapy. The MTF recognizes and includes Canadian research, www.rmtbc.ca/sites/default/files/files/New_M_T_Foundation . Research shows that massage is beneficial for many different pathologies and for all stages of life. Massage therapists are complementary health providers and are not qualified to diagnose medical conditions. Massage therapists often refer to physicians if in doubt about the medical condition of a client and about any contraindications that may arise. All NBMA-AMNB members are trained in all of the types of Massage Therapy required to meet the Canadian Interjurisdictional Competencies . All members are required to participate in continuing education to maintain, enhance and add to these basic massage competencies. 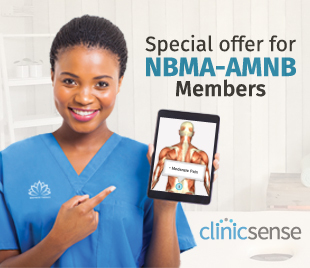 Many NBMA-AMNB members have taken further training that could assure their level of competency is beyond Basic to Experienced and even to Advanced. There is currently no standard criteria to confirm these levels. Patients may discuss this with their massage therapist to ensure that the therapist has acquired the knowledge and skills for the condition which is being treated.